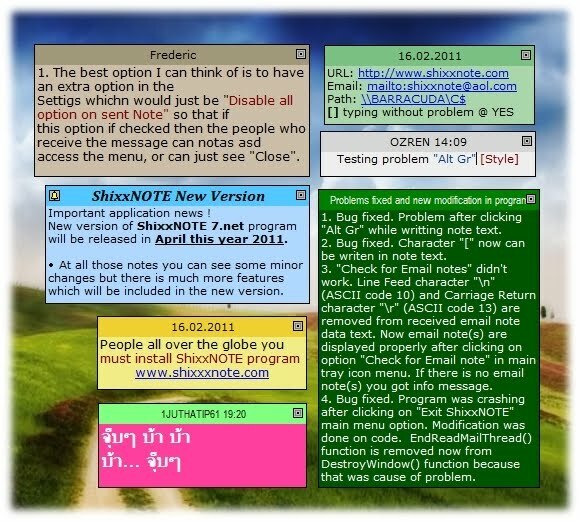 ShixxNOTE is a desktop sticky notes (post-it) program, that allows you to keep desktop sticky notes, and also send them across the network to your friends and colleagues (LAN messenger). As a program author in this blog I will write something about program, plans for new version, advanced program features, help, news, etc. So read it and comment my posts, ask me questions, write me your suggestions and ideas to improve ShixxNOTE. If you have Windows 10 with latest update (I stopped counting how many times I had to update my OS) installed on your computer, than I would like to show you how to make ShixxNOTE icon visible in your taskbar. Microsoft release update and than you have to uninstall VPN client just to get network That is my example. So now I am scared when I see that new Update is available But lets just put ShixxNOTE icon always visible. First you need to right mouse click on taskbar and select Taskbar settings i tem from menu. That item has this image beside. After that you will get this image where you have to click on “Select which icons appear on the taskbar”. Hello my name is Ozren Sirola. Born in Rijeka, Croatia. Still live and work as a software designer in a private company. Programming is my passion from early days, so as a hobby I developed shareware program and named it ShixxNOTE. Beause Shixx is my nickname. I have Economy diploma from University in Rijeka. If you think I am geek that's wrong. I like to travel, also love animals especially dogs (German Shepherd is my favorite), like good music, movies. Also I have many other areas which I am now interested. But if you want to know me better than you must meet me and talk to me. Currently I don't have girlfriend but that's long story. Now I am single about 4 years after 7 years of you can say marriage. Yes ShixxNOTE program is my program which received many great awards, also it is listed on Wikipedia. But for me most important is that I have more than 400 customers all around the world. So one day I will visit all of them and travel around the globe because I have customers on almost every continent. So check out my program and register it if you like it !